With the clock winding down to the Cleveland Browns officially being put on the clock, NFL Draft prospects are making their final impressions on teams. While most of the draft picks will come from the FBS, FCS schools do produce some picks as well. There were 15 players out of the second tier of college football last year, below the average of 18. This year sees another good chunk of prospects as well, with a potential of one coming off the board on the first day. For NDSU fans, seeing Goedert’s name be called will be a breath of fresh air. Part of that will be not seeing him once (or twice) a year from now on. Another part of that is the fact he is a very good player. For a tight end, Goedert has incredible hands and uses his body to shield off defenders well. His touchdown catch against the Bison is a fitting play to evaluate his talents. He led all Division I tight ends in receptions and receiving yards last year. Come draft day, he may come off the board on the first day, NFLDraftScout has him going off the board in the second round, the first FCS player taken. As a recent Bleacher Report article points out, Lauletta is the closest thing to Bill Belichick bait there is. He played lacrosse, compares similarly to Jimmy Garoppolo, and has family ties to the Navy. And he can ball too. Since some people enjoy discounting FCS statistics, let’s skip those and go to a game with the big boys. 8-12 for 198 yards and three touchdowns at the Senior Bowl. Not too shabby. It is worth remembering that the Senior Bowl is just a set of practices before a game, and players must quickly learn the playbook in that time. Lauletta showed he could do just that and play some big-time football. While he will likely not start in the NFL soon, most teams would like a capable backup who knows what he is doing. Lauletta can be just that and should be taken off the board early on the second day. Another Missouri Valley player is likely to come off the board quickly. He currently is hovering around the No. 16 cornerback in the draft, per NFLDraftScout. Harris was a two-time First-Team selection for the Valley and led the conference with 15 passes defended. If Bison fans were wondering where he was during the Redbirds-Bison game, he didn’t do much. He registered just a single tackle, but it was a game where the pass was not a threat. The weather was terrible in every sense of the word and Easton Stick attempted just eight passes all day for the Bison. Woe to be a corner on a wet and windy day in Normal, Illinois. But Harris is a strong player, currently leading cornerback prospects in the bench press with 22 reps.
Another day 2 calling likely for Harris. The Bison’s top prospect is currently looking like a late draft pick. A look at the workout numbers is a good indication of why that is. DeLuca posted a 4.85 40-yard dash time at the combine, slowest of the top-11 ILB prospects on NFLDraftScout. There is also similar placement in the vertical jump, board jump and bench press. But take a look at the on-field performances, and DeLuca looks like a much more NFL-ready player. Good speed coupled with great instincts is a recipe for success, and that is where DeLuca shines. 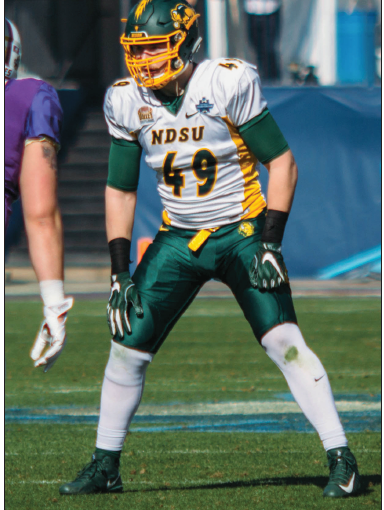 A strong ability to snuff out a play is key, and a good skill for the NDSU product. Round seven seems like the time of calling for DeLuca.